This post contains my notes on the book The Quick and Easy Guide to Effective Speaking by Dale Carnegie. Many individuals are familiar with Dale Carnegie's book How to Win Friends and Influence People. 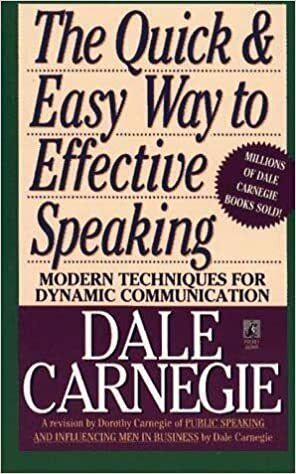 The Quick and Easy Guide to Effective Speaking is another book Carnegie wrote based on materials from his highly successful course he started teaching in 1912. I read this book in 2012, the 100th anniversary of Carnegie's unique and effective method for improving communication. What follows are my notes as I recorded them in my 2012 planning journal. You earned the right to discuss through study or experience. You are excited about the subject. You are eager to share with others. 4. Use concrete words that are familiar to create pictures. 1. Choose subjects that you are earnest about. 2. Relive the feelings you have about the topic. 1. Give an example - an incident from your life. 2. State your point - what you want the audience to do. 3. Give the reason or benefit the audience may expect. 1. Restrict your subject to fit your allotted time. 2. Arrange your ideas in sequence. 3. Number your points as you make them. 4. Compare the strange with the familiar. 1. Win confidence by deserving it. 2. Get a yes-yes response. 3. Speak with contagious enthusiasm. 4. Show respect and affection for your audience. 5. Begin in a friendly way. 2. Be mentally ready to speak impromptu. 3. Get into an example immediately. 4. Speak with animation and force. 5. Use the principle of here and now. If you found this information helpful, I encourage you to pick up a copy of The Quick and Easy Guide to Effective Speaking. It will transform how you present to others, both in one-to-one conversations and in groups. This is an signification content for readers because many great points here that I read this article a couple of times for write my essay. No doubt, this type of information I have long been trying to find. Thanks to this article I have more knowledge.